You can do the same thing in TypeScript if you prefer. When the project is created, Visual Studio shows a helpful Getting Started page. If, like me, you need to find that page again, have a look in the project folder: the file is called Project_Readme.html. I figure I don’t need to understand what they all do know, but it’s good to know they’ve been created in the right structure. That looks like something I can understand. Next time out I’ll see if I can make some simple modifications to it. A slightly bigger gap between the first and second posts than I had planned, so having to go back to basics a bit. A good place to start is this article, which gives a good introduction to Cordova. I’m interested because if you’re building apps, you’re likely to be facing the challenge of writing code to run across a variety of platforms. 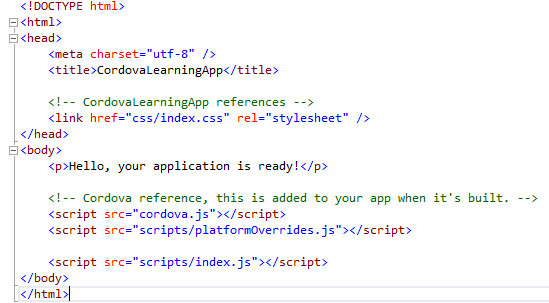 If you have web development skills, Cordova provides a way to address that challenge. 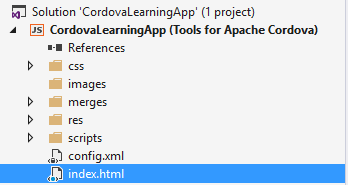 And if you have started to look at Cordova, why not provide some feedback? My next step is to start a simple app.